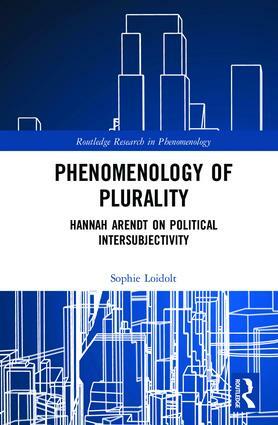 This book develops a unique phenomenology of plurality by introducing Hannah Arendt’s work into current debates taking place in the phenomenological tradition. Loidolt offers a systematic treatment of plurality that unites the fields of phenomenology, political theory, social ontology, and Arendt studies to offer new perspectives on key concepts such as intersubjectivity, selfhood, personhood, sociality, community, and conceptions of the "we." Phenomenology of Plurality is an in-depth, phenomenological analysis of Arendt that represents a viable third way between the "modernist" and "postmodernist" camps in Arendt scholarship. It also introduces a number of political and ethical insights that can be drawn from a phenomenology of plurality. This book will appeal to scholars interested in the topics of plurality and intersubjectivity within phenomenology, existentialism, political philosophy, ethics, and feminist philosophy. 5 Actualizing a plural "we"
Sophie Loidolt is Professor at the Philosophy Department of TU Darmstadt, Germany, and a member of the "Young Academy" of the Austrian Academy of Sciences. Her books include Anspruch und Rechtfertigung. Eine Theorie des rechtlichen Denkens im Anschluss an die Phänomenologie Edmund Husserls (2009) and Einführung in die Rechtsphänomenologie (2010).